The paint effect of the sponge is the most famous of all effects, most people consider it is the easiest, But we must be careful of some things not to have unpleasant results. This method is used for creating a speckled effect with two or more colours. 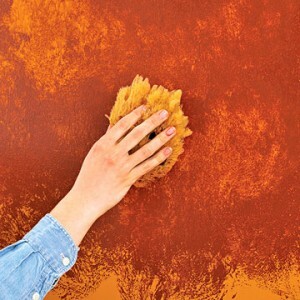 First of all here is to make the right choice of colors The base coat of colour is applied to the wall and the other colours are dabbed on to it, using a natural sponge. 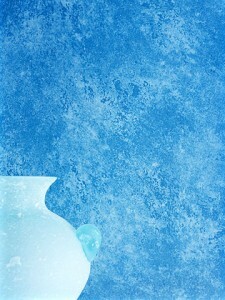 Base coat : Apply a base coat latex in desired color and cover well all wall surface. Allow the base coat to dry well for about 24 hours.The sponged paint will be use is glaze and it is a transparent effect. Take a little of the paint diluted into a bowl. Dampen the sponge with water and squeeze it out. you can test the effect on a piece paper by pressing the sponge on it before use it on the wall so you will see how your hand will handle it. If you are satisfied with the result you can start working on the wall. Fill the sponge with paint, as before and continue on the wall. 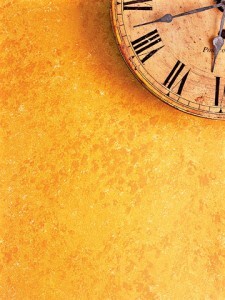 When the wall is finished, leave the sponged on colour to dry for 24 hours. If desired, a second colour can be sponged on in exactly the same way. AnotheR way to do this effect is first to cover all wall with glaze paint with a roller and theN with A dampen but well squeeze sponge press on the wall before glaze dry.